I hope Kellie puts the LADY VOLS LOGO back on the front of the uniforms, and adds the Summit Blue. Nike n Hartess did everything to erase out tradition. Agreed, this ain't Oklahoma State! I have heard softball will have new uniforms with lady vols script on the front next season. I’m sure the basketball team will have new uniforms too. I don’t care what they do as long as she doesn’t let them roll up their shorts. ... or lose to Alabama again!!! BTW, if CKH does a BBB (bring back blue), then I demand Barnes do it for the men's too in throwback to the 80s fashion! I doubt you're in a position to "Demand" anything. They look great, nice neat and clean. 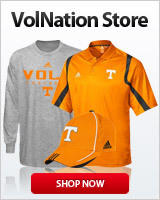 Even has the lady VOLS logo on the shorts just like everyone wants!! I do like the light blue, but only in accents, borders, not the majority of the uniform. The men no longer wear gray, in any sport if I'm not mistaken. All I care is winning not color. Why do we keep having this conversation? Move on already. I seem to remember there was a movement by the Athletic Dept. to "merge" the "Lady" into just Vols. I think it would take more than "Coach K" to make the change back. Along these lines, if it is to be done, let's wait until the team plays up to the standard of "Lady Vols" before returning to this tradition. IMO it creates too much in fighting and by consolidating the 2 there is no exchange of money from the men's side to the women's.